I can’t throw out old makeup. That’s it. No clever pun, no witty double entendre to make you snicker. I’m just admitting I can’t throw out old makeup. Sure, if a compact falls on the ground and the powder splinters into a million shards, then I’ll dump it – only because it can’t be salvaged. But why, tell me why, I cannot discard the dozens of tubes of lipstick that I will never wear? It isn’t just because I’m a hoarder (though not the piles of newspapers, dead animals under the bed type), because I can go through my closet and donate scads of clothes throughout the year (which gives me a great justification for buying more). It’s deeper, more esoteric than that. I think the lipstick is the worst. I’ll keep tubes that, when I open them, I actually shudder I hate the color so much. But, come on! That stuff is expensive! Okay; so most of them I didn’t actually buy: free PWP from Lancome and Este Lauder (why do they always pick the worst shades? ), gifts from a friend who works at Cosmair (in shades that no one who actually knows me would ever think I would wear). I sometimes justify keeping them for my acting, but then why don’t I put them in my makeup travel kit? Eye shadow? I use about 3 or 4 shades, tops, but I have eye shadow ranging from teal blue (when does that ever look good?) to lime green (no comment), some of it – I hesitate to admit – dates back to my first job out of college, where I was a hippie and feminist (going from that to working in NYC was a real culture shock). I could give it away – but who wants used makeup – because, obviously, I had to try it all out. So, I’m stuck. Between a tube and a pink face. This entry was posted on Thursday, November 18th, 2010 at 3:04 PM	and is filed under Grooming. You can follow any responses to this entry through the RSS 2.0 feed. You can leave a response, or trackback from your own site. Because “one” day/week/month in your life, that shade really looked good. OK, I read Beyond Babedom all the time and this is the first time I’m responding. Lucille, I love you, the OCD, the political commentary, etc., you’re a wonderful writer but the makeup has got to go, it’s unsanitary. 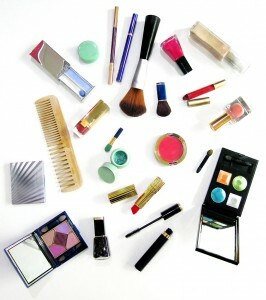 Immediately, when you read this message, go through your make-up, throw away anything that you do not use on a daily or at least a weekly basis (all of my make-up is in a small make-up bag). Years ago, I used to keep make-up thinking I might use it some time but then I read an article about it expiring and being unsanitary (kind of like not washing your hands after you go to the bathroom). I apologize for the long reply but this is a health issue. Oh, I don’t use it. . . I just keep it. And, as if I could do that. If I could, I wouldn’t have this problem, would I? Yes- I have a drawer full of lipsticks, eyeshadows, eyeliners, etc that were free gifts from Clinique, Tarte, and other higher end cosmetic brands. I will never wear these but I just feel so bad trashing them. So I let them take up space for a couple of years until they are so old that I have to let them go. Logical? Far from it. I have the same problem. I have 40 tubes of lipstick. HA! ha!!!! aLL colors and nail polish to match. Mary Kay is my favorite makeup. Why do we hold on to these things? Nostalgia, inability to let go? Who knows but its nice to know I’m not the only one. me too!! count me in for every hair care product that was EVER on the market.ebay anyone? I think it all goes back to growing up where we had what we needed, but that was it. It stems from having to do without. Now we keep everything in case we need it someday. And we couldn’t waste ANYTHING. I’ve found throwing out my old make-up, which some of it I had for years, very freeing. As far as all of the other “stuff” I was holding onto-giving it away is a really good feeling. It’s still a work in progress. SO nice to know I am not alone with this affliction. I have conquered broken powders (eye shadows & blush) along with mascara. I MADE myself throw away the lipstick I wore to my wedding, 25 years ago in this last move, 09/10. It is, to me, something to do with our own sense of largess? I did break up with buying ANYthing with the “free gift” makeup as this compounds my collection & am on THAT wagon for over 5 years now. Guilty. It is always a work in progress.